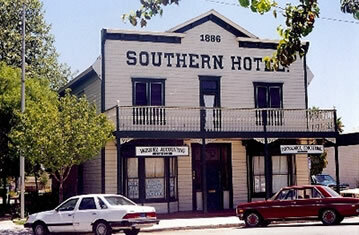 The Southern Hotel is the oldest preserved commercial building still standing in Perris, California. In 1886, swiss immigrants, Bernardo and Marcellina Bernasconi completed construction of the Southern Hotel. 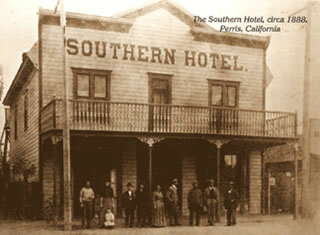 It was the first hotel in Perris to readily meet the needs of travelers and miners in the San Jacinto Valley. In 1901, in order to be closer to the schools, Marcellina converted the hotel to the family’s weekday private residence, moving in with her six children. Matilda, the eldest daughter of the Bernasconi children was the last to live in the hotel as a private residence. Once she passed away in 1982, the hotel became abandoned, was declared an eyesore, public nuisance, and set ablaze in two back-to-back arson fires. In 1990, brothers, Leon E. and John D. Motte purchased the Southern Hotel’s property, restoring it like new again. As a result of their hard work, it was dedicated to the National Registrar of Historical Places. Motte Historical Museum is a 501(c)(3) non-profit organization involved in Perris, California and the nearby areas surrounding Perris.